I was first introduced to GPU overclocking back in the early days of 3DFX, I stumbled on an article demonstrating how to get extra juice out of my Voodoo 2 graphics card, and since then I’ve been hooked on graphics technology. Overclocking GPU’s has become more sophisticated since those early days – but the basic principals remain the same as ever. In this article we’ll be exploring overclocking MSI’s GeForce GTX 960 Gaming 2G graphics card (review here), using the free and well-known AfterBurner utility. While this article focuses on the GeForce GTX 960, the guide can be used for virtually any modern graphics card out there, whether it’s an Nvidia or even an AMD card. Before you start overclocking, be sure you’re running the latest drivers – if not head to your GPU’s vendor and grab the appropriate drivers for your operating system for best performance. We’re running Windows 10, so we pointed our browsers over to Nvidia.com and downloaded the 353.64 drivers (the latest as of the time I’m writing this) for Windows 10 64-bit. For the sake of starting afresh, we decided to do an advanced install and selected the “clean install” checkbox. Be warned it wipes all of your settings, but because we were previously using Beta drivers, we wanted to start with a clean slate. After rebooting the machine, head over to MSI’s Official Afterburner webpage and downloaded its latest version (4.1.1 as of the time I’m writing) and go through the install process. If you want to ensure you’ve got even more data, download GPU-Z (we’re running version 0.7.9 for what it’s worth). This application isn’t vital, but will help you keep tabs on what speeds your card is boosting too, heat and even the amount of RAM you’re reaching. You can run multiple instances of GPU-Z too, to monitor different things. Right, now you’ve done the basics you’re ready to start your voyage of overclocking the GeForce GTX 960. A little word of warning – if you’ve only just installed the card, ensure you run and test at stock for a few hours first. This helps you ensure that everything is working okay, and you’re system is stable before you throw in running higher clocks into the mix, and therefore helps you diagnose potential problems. The image above is what you’ll see when you load up Afterburner for the first time, the application tells you that we are indeed running a GeForce GTX 960 (good to know!) and also confirms our driver version. If you don’t see the “Core Voltage (mV)” option, then click on the settings button and under the “general” tab make sure that you’ve ticked “Unlock voltage control” and while you’re at it also check the “Unlock voltage monitoring” tickbox too. We’d recommend you leave the “Force constant voltage” option alone in Afterburner – it will just put extra voltage through your card while sitting at idle, and generally doesn’t really help with overclocking. Essentially, overclocking is as simple as moving the sliders on both the Core Clock and Memory Clocks to the right (increasing them) – but do so gradually. Unfortunately, the term “Silicone Lottery” exists for a reason, and you might be really lucky and get an extra 200MHz out of your core clock, while your friend with the exact same GPU may only get 120MHz. For this reason, we want to ensure that you don’t tick “apply overclocking at system startup” either. If your system does happen to lockup, a simple reset will solve the problem – typically Nvidia’s Driver will stop working and Windows will automatically recover it (and generally crash out of the 3d application you’re running). Nvidia’s Maxwell architecture is very thermally efficient, putting out considerably less heat that Kepler and older generations of GeForce graphics cards. But for step one, we’re going to crank the fan speed up to about 85 percent. MSI’s GeForce GTX 960 Gaming 2G has a pretty silent cooler, and it’s barely noticeable even at this high fan speed, despite our test rig having its side open. Uncheck the “Auto” to the right of Fan Speed (%) and then simply move the slider up as desired and click “apply”, doing this helps eliminate excess heat being the cause of an overclock failing and instead we can more confidently say that you’ve reached the limits of hardware. This is particularly important for cases with poor airflow (and a good reason to have good cable management). 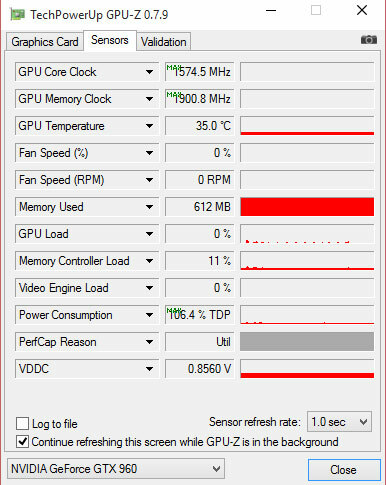 Load up GPU-Z (we’re going to be assuming you’re running it for this guide) and click on the “sensors” tab at the top. There’s a down arrow next to the various things being monitored, we want to select both core clock and memory clock of the GTX 960 and have them monitor the “highest” reading. You might also wish to do the same for “Power Consumption” too. Now we’re going to start overclocking the GeForce GTX 960 using Afterburner, so bring the application back to the foreground and increase the clock speeds a little for both the core clock and memory clock. Typically you should be able to increase both clocks about 50MHz without much trouble (but your mileage may very) so start with that, leave the voltage and other controls at default (apart from the fan as we adjusted earlier). Load up a game or application to benchmark with – GTA5, Tomb Raider, Metro (both last light and 2033), Sleeping Dogs are just a few titles which have their own benchmark mode – or you could load up a demanding application and play for about 10 – 15 minutes. You’re looking out for crashes (obviously), strangely colored pixels, black bars on the screen, garbled imagery – basically the image won’t look how it’s supposed to if the overclock has been pushed too high. Increase the clock speeds more – but this time stick with just one clock – either memory or core. Continue to increase that clock until you notice one of the above ‘problems’. For sake of argument, we’ll assume you’re overclocking the GTX 960’s Core Clock first. Raise it by 15 – 20MHz, retest, raise another 15 – 20MHz, retest and repeat until you get a crash and then back up to the last ‘good’ setting. Repeat now for the GTX 960’s (or whatever GPU you’re using) memory with the same care. You’re now free to leave the card ‘as is’ or if you’re feeling confident and want to try for even more performance, you can try adjusting both the Core Voltage and Power Limit. While I’ve personally never harmed a graphics card for this, neither myself or anyone here at RGT accept responsibility if you do somehow damage your card. Different manufacturers and board partners set different maximum’s. You can flash your bios or otherwise increase these limits, but this is a basic guide and we won’t be covering that here. For our MSI GeForce GTX 960 Gaming 2G, the max available was 100 Mv and setting the power limit to 108%. Core Voltage is fairly simple – increases the voltage the GPU receives (that’s the GPU chip itself, NOT the memory / other parts of the card. It’s like increasing the voltage on say your CPU while leaving your Memory alone). 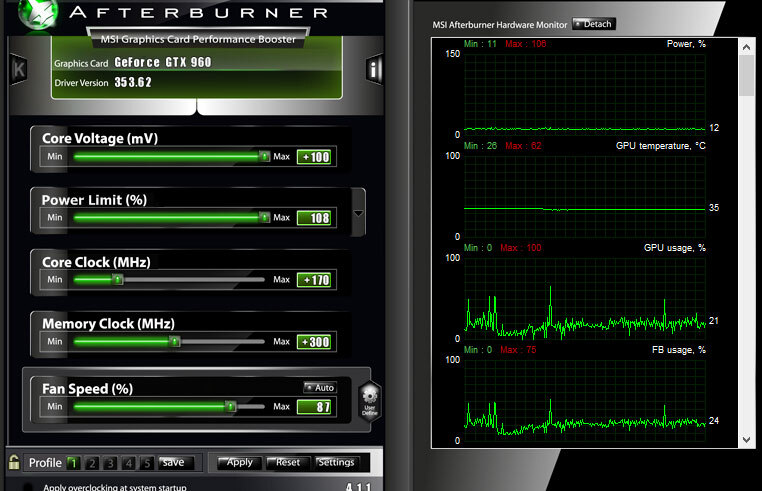 Higher voltages allows for either a higher or more stable overclock. Power Limit is a bit more complex, but effectively increases the maximum TDP (Power draw) that the card can have. Increasing this power draw means that your card draws more power into it, and can help once again in scenarios where you’re pushing the limits of your card. Increase the clock speeds – just like last time, further overclock GTX 960’s Core Clock first, 10 – 20MHz this time, and repeat until you get either garbage on-screen or a crash. Revert back to your last good settings, then raise the clock speeds of the RAM. Once again, as a reminder – overclocking virtually any modern GPU is very similar – whether it’s a GTX 960, a GTX 980, a Radeon R9 290X or a Titan. Now you’ve found your ‘max’ clocks you can then leave the fan on auto (or manually set the fan to a lower speed, say 50 percent) and see if the slightly warmer temps affect the overclocking ability of the card. We’d suggest playing a graphically intensive game (or leaving a benchmark looping – Metro is perfect for this) and use GPUZ to monitor the TDP / core clocks by asking it to monitor the ‘average’. If you so desire, you can also have it “log to file” (found under sensors). This can be helpful if you notice your frame rates sometimes dipping – as it’s possible your card is being thermally throttled or hitting the Power Limits of the card. If you so desire, you can save your settings as a profile. Simply click the “save” button at the bottom of Afterburner and the numbers next to Profile will flash green, simply click on one of them (I opted for “1”) and it’ll remember those settings. If you then reset your clocks (by clicking reset…) for less taxing games, you can simply click “1” and it’ll load your high performance overclock settings. Simple, eh? If you’re curious about our maximum overclock for the GeForce GTX 960, then we managed to add an additional 170MHz to the Core and 300Mhz to the RAM, pushing the memory bandwidth up from 112GB/s to about 122GB/s… which isn’t too shabby at all. 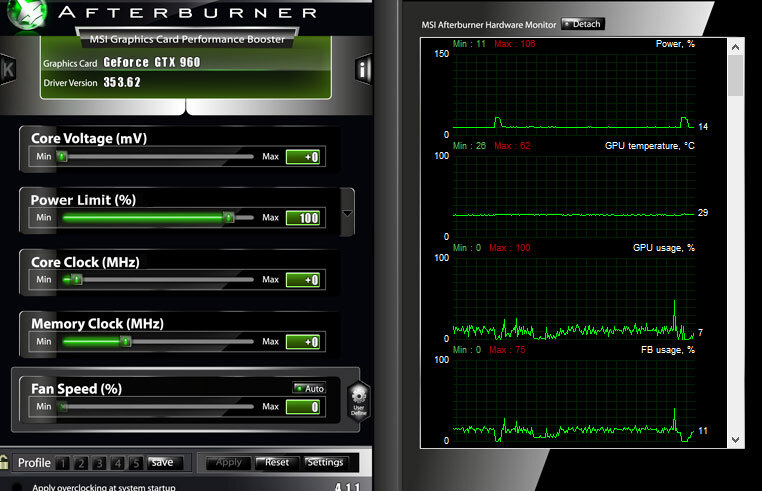 The GPU will now boost to a minimum of 1423MHZ too, a nice improvement over the 1253MHZ standard boost. This article was filed under Articles, Features, Gaming News, Hardware. Tagged with afterburner, geforce, GTX 960, guide, hardware, maxwell, overclocking, performance.